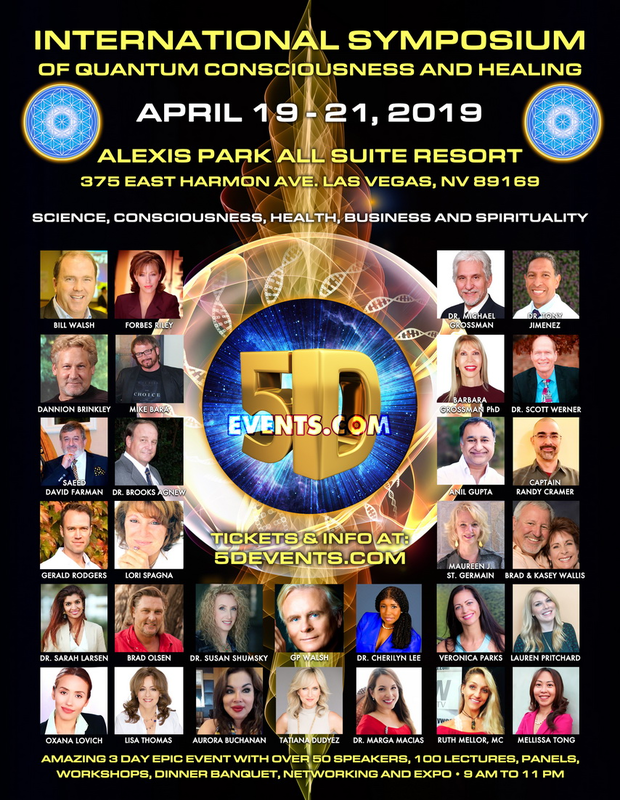 Annual Las Vegas Global Gathering of Scientists, Researchers, Business Leaders, Influencers, Life Coaches, Healers, Space Scientists, ET Disclosure groups, Whistleblowers, Visionaries, Star Seeds & Lightworkers and Public building a New Humanity Movement with a better future for mankind. Please join us at this amazing 5D events exploration of the five precepts which we consider to be fundamental allowing ourselves to further Quantify & gauge the following “Health, consciousness, science, Business & Spirituality”. Within these three days we shall have the most prominent keynote speakers in each area of those dimensions which will discover and engage with workshops, lectures & panels on some of the most prominent questions in our lifetime. Amazing 3-day epic event with over thousand attendees is about creating a better future with Quantum consciousness, Anti-Aging, Anti-Cancer, DNA Activation, Longevity, Quantum Healing, Space Science, ET Disclosure, Business Leadership, Personal Empowerment, Spirituality, Life Mastery plus many more topics with many Keynote Speakers giving over 100 Lectures, Workshops, Panels, Expo Exhibits, amazing panels, Networking plus Friday Night Speakers meet and greet rooftop party and Saturday night Dinner Banquet party with Speakers. Bill Walsh, Dr. Brooks Agnew, Dr. Michael Grossman, Dr. Antonio Jimenez, Dannion Brinkley, Captain Randy Cramer, Forbes Riley, Mike Bara, Dr. Antonio Jimenez, Anil Gupta, Maureen St. Germain, Dr. Sarah Larsen, Dr. Scott Werner & Dr. Susan Shumsky plus many more awesome speakers. ***Event hours: This Event starts at 9 AM on Friday April 19th it goes until 11 PM, Saturday from 9 AM to 11:45 PM and Sunday from 9:00 AM to 9:00 PM. This Event has 4 speakers speaking at the same time in 4 Ballrooms. Estimated number of attendees for 3 days are 2000 people. Room rates from $69 includes free Breakfast for 2 people. ***Nearest Airport: only 10 minutes away driving from Las Vegas International airport with free hotel shuttles every hour only at Terminal 1. ***Exhibits: Exhibit hall is free with day pass and is only $10 for public to visit which can pay cash at the door. Exhibit set up starts from 8 AM to 11 AM on Friday April 19th and starts at 11 AM till 7 PM on Friday and 9 AM to 7 PM on Saturday and Sunday. Event starts at 9 AM ends at 11 PM of Friday, Saturday and Sunday ends at 9 PM, exhibit times are 9 AM to 7 PM DAILY, Friday starts at 11 AM. Exhibit halls open from 9 AM to 7 PM (over 100 exhibits). Exhibit 8 FEET BY 30 INCHES Tables are $500 and 10 x 10 booths are $1500 made of 2 of 8 feet long tables, and 10 x 20 Booth is $2500 (they all come with 2 chairs each). 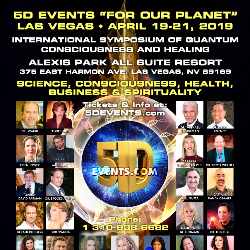 ***Opening Ceremonies, Friday April 19TH, 2019 from 9:00 AM to 11:00 AM, with Saeed David Farman Opening Gates of consciousness, Manifestation of 24 Strand DNA Activation by Dr. Scott Werner, Opening Speech of Dr. Sarah Larsen “The Miracle Maker”, Event MC Ruth Mellor, Paradiso and Rasamayi Sacred Sound Activation, Alanna Star singing & Sound healing by Siberian Shaman InfinteMa (Valentina Cross) Sacred Drumming Circle. Music by DJ, Hot Hors D’oeuvres & Drinks at the Cash Bar. Mixed Greens Salad with Choice of Dressings Marinated Artichoke and Mushroom Salad Mediterranean Cucumber Salad with Feta and Olives. Chef’s Selection of Specialty Pastries & Sweet Delights Freshly Brewed Regular and Decaffeinated Coffee, Hot Tea. Join us for an evening of unforgettable evening of hilarious entertainment interlaced with life changing truths. During the power of the Mind hypnosis show, master Hypnotist and subconscious reprogramming expert, Gerald Rogers will lead you on a journey where you will Laugh 'til you cry and discover principles of the subconscious that you can use to transform your life. 6:00 AM to 7:00 AM, Terrace Rooftop of Parthenon Ballroom (Catch the elevator at the entrance of the Parthenon to the terrace, bring your Yoga Mat or folding chair), 24 strand DNA manifestation & Easter prayer by Dr. Scott Werner and Sufi Meditation and chanting by Saeed David Farman. This panel is about sharing all conscious achievements by speakers for 3 days of 5D events and reaching a common positive transformational result to push Humanity forward to a new Timeline. Meet and greet party on Friday night is $25 and Saturday Dinner banquet is $65 extra. Exhibit expo halls are free with day pass and is only $10 for public to visit paid cash at the door.